A Wellington based firm has received a business boost from Retail Entrepreneur Theo Paphitis. Last week, Air-Seal Products, tweeted Theo about their business during ‘Small Business Sunday’ and was one of six weekly winners to gain a retweet by Theo to his 500,000 Twitter followers. The weekly initiative, set up by Theo in 2010, now has over 2200 #SBS winners and supports small businesses in the UK. Business and retail entrepreneur and self-confessed Shopkeeper, Theo re‐tweeted Air-Seal Products message to his almost 500,000 followers and as a result, Air-Seal Products has more followers on social media. They are also profiled on the #SBS website (www.theopaphitissbs.com) that is exclusive to all Small Business Sunday winners. Mr. Paphitis said: “My vision is that everyone who has ever won a #SBS re-tweet from me becomes part of a friendly club; like-minded individuals who can share successes and learnings. Anyone looking for a re‐tweet from Theo should tweet him about their business on Sunday between 5pm and 7.30pm and include the hashtag #SBS. Transport Engineer - Tyres: Are tyre sealants appropriate for CV fleets? Punctures are a problem Idris Stephens contends with every day, in his role as tyre fleet engineer at Smith’s (Gloucester). A mixed fleet of 150 vehicles works on duties such as waste management, where off-road work cannot be avoided. In 2005, he discovered the heavy-duty liquid sealant from Air-Seal Products at the Hillhead Show in Buxton, Derbyshire (returning this month: 26-28 June). 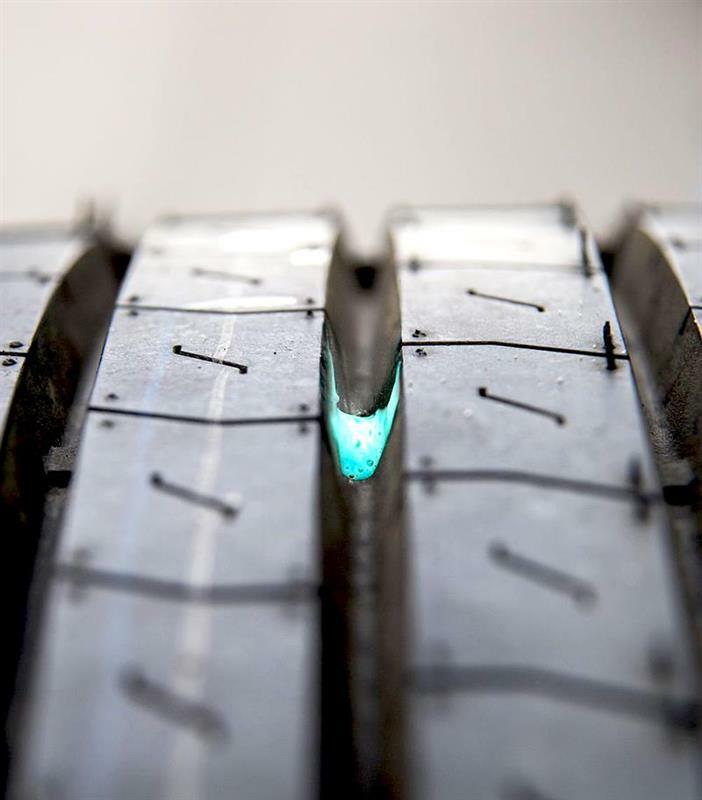 A trial proved that the tyre sealant could extend its tyres’ working lives, and save money. The fluid, either ethylene or propylene glycol-based, is poured inside the tyre, and is free to flow as it rotates. The tyre’s own air pressure forces fibres and fillers suspended in the fluid into the hole, and stops the leak. Smiths’ drivers regularly check tyres for foreign objects. Stephens adds: “We don’t want them pulling out nails just in case the sealant doesn’t take, and the tyre deflates. We do visual checks at the workshop and can tell if the tyre pressure is down. We’ll check it, take out the object and let the sealant do its work, then reflate the tyre back up to the correct pressure,” he says. Determining exactly how successful the sealant has been for the fleet is difficult, he admits, but he does say that its vehicles tend to have less downtime since it started using the sealants. He also uses sealant on larger off-road plant vehicles, and in one case discovered a tyre with more than 20 nails, all successfully sealed. Although used in North America for more than 40 years, Belgian product Ultra-Seal was only introduced to Europe in 2016; Tamworth-based Trans UK Equipment Management is the UK distributor. The Ultra-Seal fluid, inserted before the tyre is mounted on the hub, includes rubber and fibres, and has an anti-rust and anti-corrosion formulation to protect the rim (pictured above). As well as trials with major transport and logistics companies, Ultra-Seal also supplies Danish transport company DSV, which runs more than 7,000 trailers. “They have seen a reduction in punctures, blow-outs and breakdowns in tyres filled with Ultra-Seal. Tyres last about 35% longer due to better tyre pressure and therefore less tyre wear,” claims business development manager Carla van Santvoort. A mix of short haul with off-road travel is the right scenario for using preventative tyre sealants, according to Stuart John. He is sales director of aftermarket firm Rema Tip Top Automotive UK. States John: “We are approached by a lot of plant hire companies, construction and off-road operators who use sealants in those situations where you might pick up a foreign object. That is where you have the benefit of tyre sealant. Instead, he recommends long-haul operators fit a tyre pressure monitoring system (TPMS) that would identify a puncture or loss of pressure immediately. This technology may compete with the upper end of tyre sealant products. For example, Goodyear has stopped producing Duraseal, a sealant system that is part of the inner lining. It promotes its Proactive Solutions fleet monitoring system instead. Other tyre manufacturers still offer sealants for cars and light commercial vehicles: Continental produces ContiSeal, which is a viscous layer on the inner side of the tyre for punctures up to 5mm diameter. Michelin makes Selfseal; Pirelli produces Seal Inside tyres. In general, tyre manufacturers steer clear of retro-applied remedial and preventative sealants, both as products and in commenting about their use. Multiple tyre manufacturers contacted declined to comment for this article. Belgian company Ultra-Seal took its battle to get sealants recognised as a genuine solution into court, and has prevailed over tyre associations in Germany and Denmark. By extending tyres’ working life, even if only on a temporary basis, sealant suppliers are providing competition to Europe’s tyre manufacturers. We are thrilled to announce that we have been officially awarded our Silver Membership with Constructionline! Constructionline is a register of pre-qualified suppliers and buyers, to government standards and allows buyers and customers to know we have been pre-qualified which takes some of the hard work away from them. Pictured our Chilean distributor with another happy customer. Having tried an inferior tyre sealant, security company Prosegur continue to see the benefit of our premium sealants. Almost three quarters of motorway incidents related to tyre failure could be prevented if drivers carry out simple checks, according to startling new research unveiled by Highways England and tyre company Bridgestone. Expomin show in Santiago Chile. Here is Said Gidi, our Chilean distributor from Airseal-Chile, exhibiting at The Seguridad Show in Santiago, Chile. The show runs from 23rd - 25th October. You can find Said demonstrating our premier tyre sealants on Stand Number 643 ES. Several leading tyre manufacturers have just increased their prices by up to 10% and also limited production of larger tyre sizes are resulting in a delayed delivery. Use our tyre sealants and we can increase the tyre life by up to 20% and save you from replacement costs for your existing and new tyres.